Posted by barrets on Monday, October 29, 2018 in News, News & Events. Multimodal digital projects have been increasingly integrated in curriculums across the university. This panel will explore how to cultivate skills associated with their composition. 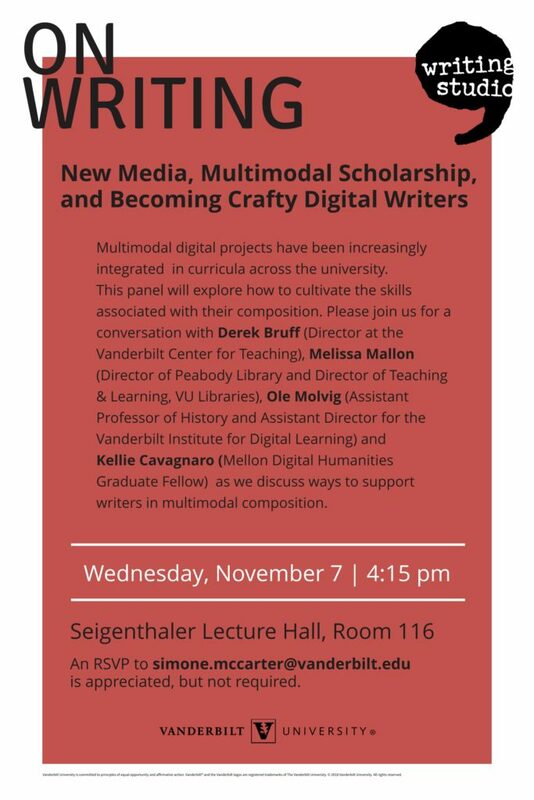 Please join us for a conversation with Derek Bruff (Director at the Vanderbilt University Center for Teaching), Melissa Mallon (Director of Peabody Library and Director of Teaching & Learning, VU Libraries), Ole Molvig (Assistant Professor of History and Assistant Director for the Vanderbilt Institute for Digital Learning) and Kellie Cavagnaro (Mellon Digital Humanities Graduate Fellow), as we discuss ways to support writers in multimodal composition. Refreshments will be served. The event will take place on Wednesday, November 7 at 4:15 pm in the Seigenthaler Lecture Hall, Room 116. An RSVP to simone.mccarter@vanderbilt.edu is appreciated but not required.